Kilkenny County, Ireland Horse Directory - O Horse! 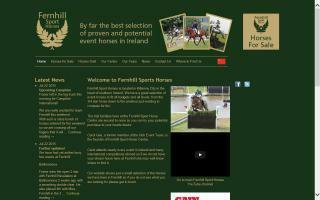 Fernhill Sport Horses is located in Kilkenny City in the heart of southern Ireland. We have a great selection of event horses to fit all budgets and all levels, from the 3/4 star horse down to the amateur just wanting to compete for fun. The trial facilities here at the Fernhill Sport Horse Centre are second to none, so you can try your potential purchase to your heart's desire. Carol Gee, a former member of the Irish Event Team, is the founder of Fernhill Sport Horse Centre.